"Guide to Successful File Data Management"
Are you certain your file data environment is being managed in the most efficient way possible? How is it possible to make your file data storage twice as efficient, resulting in reduced costs and complexity? A new approach entitled File Data Management (FDM), provides the ability to understand, manage, monitor and secure stored file data across the entire data storage environment, down to individual users and files, regardless of platform, location, or brand. In other words, File Data Management (FDM) is the storage category that addresses the management of file data. The traditional storage resource management (SRM) category does not focus on the “big picture” – managing the files. It focuses on the infrastructure to store files, but not the files themselves. What are the steps in implementing a File Data Management plan? 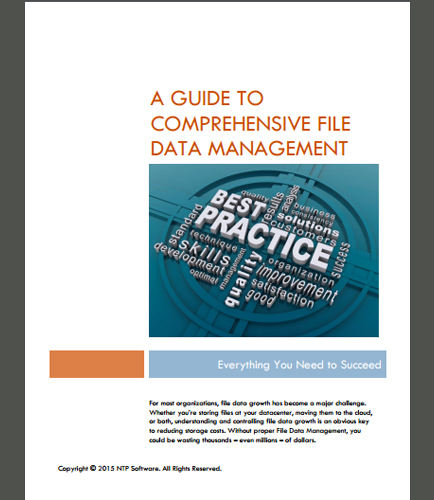 Download this whitepaper to learn more about File Data Management and how FDM can be used to gather the information you need to gain insight into your storage environment and formulate a better management plan for your file data.